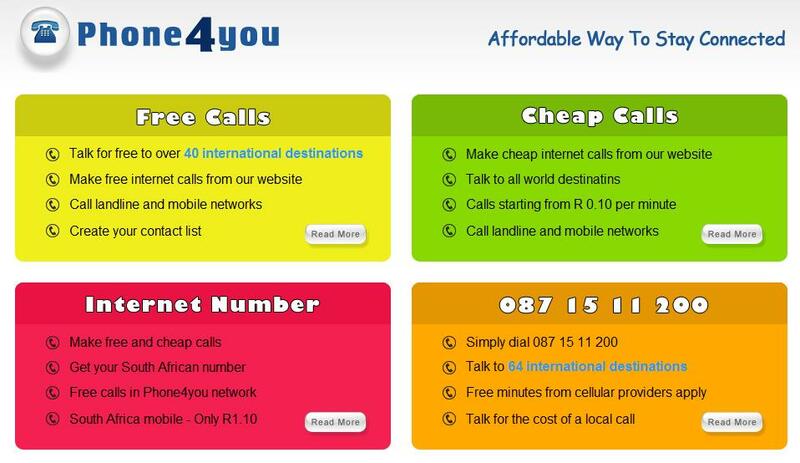 Phone4you : Free International Calls | Get South African Number | Free Pc to Phone Calls, Free Voip Calls to India International ! Are you still using your mobile phones for making international calls. If yes, then trust me you are losing a lot of money. With voip you can save a lot of your phone bills. If you have been following Free Pc to Phone Calls blog, then you need not to pay for making phone calls. Today we discuss about another voip provide Phone4you, which is offering Free international calls to over 42 countries. 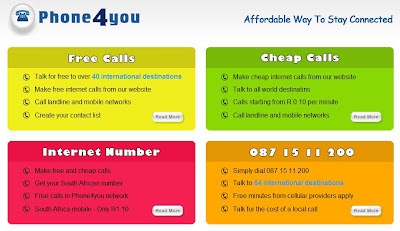 Phone4you, a South Africa based voip provider, a free telephone system, which is based on advanced VoIP technology. The aim of this network is to serve as an alternative to fixed telephone lines, providing lower prices, greater opportunities and maximum accessibility to all. Apart from offering free international calls, it is offering a South African DID number (for free). You can receive calls on this South African number (South African Incoming phone number). 2. You will receive verification email from Phone4You with username and password. 3. Login to Phone4you website account. After login to your account, click webphone. 4. Enter number with international format，00991989xxxxxxx (eg for India). Phone4You offers another way by which you can make free calls to about 60 countries. This includes India. (Free Calls to India from South Africa). 1. Dial 087 15 11 200 (local charges may apply). 6. Cool. Your calls gets connected! The website is somehow not loading...!! I have even tried to check it with US proxy but it didn't worked. The site is working now for me. How many minutes per call ? Any idea ? Can you please tell me how to call India from US? Is there any hack for this?